At Nebraska Star Beef, we strive to “keep it real” with our marketing, and keeping it real means we try to remove the fog of BS that can engulf really simple things. One of our biggest “hot buttons” is Wagyu beef and the complete lack of understanding that exists in the general market. Wagyu is simply a breed of beef. Other breeds of beef include, but are not limited to: Angus, Charolais, Hereford, Long Horn, Short Horn, Brahma, etc, etc … Wagyu cattle originate in the Hyogo Prefecture of Japan. Kobe, Japan is a large city in the Hyogo region. Kobe is also responsible for one of the most iconic varieties of beef in the world. Kobe Beef. Marketers, especially western marketers, have taken some pretty big liberties with “the fog” of confusion when it comes to the general lack of understanding about breeds as well as the geography of Japan. All Kobe beef is Wagyu beef BUT not all Wagyu beef is Kobe beef. Kobe beef is a style of beef specific to that region of Japan. If one wants real Kobe beef, a trip to Kobe is required … or the beef needs to be flown here, from there. That simple. Wagyu beef cattle can be found pretty much everywhere. While they are not as prominent as westernized breeds like Angus, Hereford, or Charolais which have been aggressively bred for efficient beef production, Wagyu beef cattle are not terribly uncommon, especially in the United States. So if Wagyu cattle aren’t uncommon, what’s the big deal then … why so expensive??? A lot of people are making a KILLING on this Wagyu beef – Nebraska Star Beef included – right?? Actually No. Not really. Here are the cold hard facts about producing Wagyu beef. It IS MUCH MORE EXPENSIVE to produce Wagyu than it is to produce westernized breeds. It can take well over twice as long and twice as much feed to create a pound of Wagyu beef as needed for a pound of Angus beef. Time and raw materials going in equal heavy cost increases coming out. It’s simple economics. Wagyu steaks get even more expensive because almost all of the additional cost to produce the beef is forced onto the middle meats, aka the steak cuts, which comprise only about 25% of the meat on the animal. The other 75% of the meat doesn’t really gain a tremendous amount of value over open market price as it usually ends up being ground into hamburger. So all of a sudden all of the 2X higher production cost must be absorbed by 25% of the meat. This leads to the most important question of the blog: Is Wagyu beef worth all the extra cost? Wagyu beef IS absolutely different than western beef. 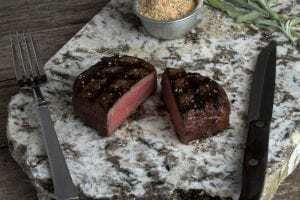 It looks different, it tastes different, it has more marbling, it’s generally much richer than a comparable cut from a High Choice or Prime cut of Angus. So, does this make it better? If a customer is looking for the aforementioned features, then yes, it is better. Wagyu will always be significantly more expensive than traditional US beef cattle breeds simply because it takes much longer to produce and once it is produced, the additional production cost is absorbed by a fairly small amount of the total carcass weight that make up the steak cuts. As a serious beef producer, we consider Wagyu to be something of a novelty as it does not fit our model of production efficiency. That said, we also realize that we would be silly to not recognize that there is significant retail demand for Wagyu beef and do our best to offer this as a product. We go to the same lengths with our Wagyu beef to ensure that it is the absolute best it can be. We utilize the same feeding and aging process that we do for our Angus beef and the steaks are expertly cut to exacting tolerances. Wagyu is different. Wagyu is exponentially more expensive to produce than other beef – Wagyu purveyors aren’t just “price gouging”. Wagyu is not “everyday beef” for most people. It is something special that we are proud to offer in our line of premium products.